On February 15th LaRouchePAC posted a Video featuring Jason Ross elaborating on the Role of Leibniz for mankind in general. I have some comments to make about that. Now, it surely comes as no surprise that it is a great challenge to depict all of Leibniz' achievements into one hour of video production. (I did not manage to cover one of his treatise in less than 8 hours of video.) Given those circumstances Jason Ross managed to give a very valid overview account of Leibniz's major works and influences, and this certainly not without the help of LPACs and EIRs history department, partly on behalf of the late Graham Lowry, who gave some detailed account of his research in his marvelous book "How the Nation was won", where he described quite detailed the political infighting relationship between the House of Hanover and the successors of the Marlborough-Clan in order to keep the oligarchical principle afloat for some more time to come. After reading Lowry's book I came to the conclusion that it would rather make sense to post-humously investigate the cause of death of Queen Anne and Sophie of Hanover instead of digging out Tycho Brahe Corpse in order to find out, whether Kepler had killed him with mercury to get hands on his celestial data, which was of course proven wrong. However, as most outstanding scholars and political figures of their time, who followed their best of intentions to improve the conditions of mankind, Leibniz had to depend on wealthy patrons in order to pursue his studies, investigations, publishing and organizing activities, which made him vulnerable to sabotage and betrayal once they realized, what he was up to. Some of those patrons where open to the idea of a creative mankind and when those died, others with less noble intentions managed to pretty much block him in most of his crucial endeavours and tried to maneuver toward the killing of his legacy. But as it is the case very often in history, some time after Leibniz had passed away, people who knew that Leibniz was right and who shared his intentions for the best of mankind, kept his legacy alive and today it is clear to what extent Leibniz contributed to the existence and well-being of our culture. Leibniz creativity was so vast, that my medium sized bookshelve at home does not provide enough capacity to hold the entirety of his expanded works. That may not mean much, as I am living in quite a small house, but still, the variety of fields he covered was enormous and is still quite unparalleled today. 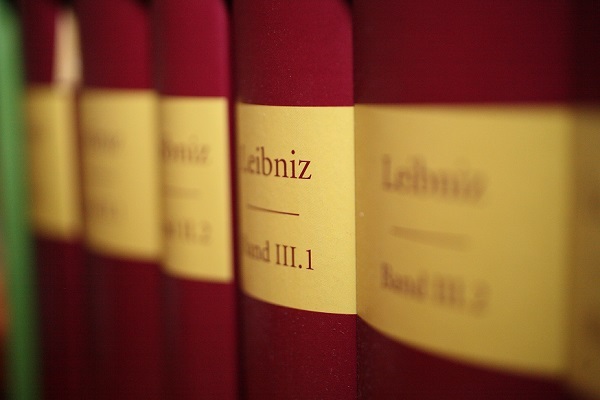 A collection of Leibniz volumes, which I happen to possess, carry his motto "Die Handlungen der Menschen leben fort in ihren Wirkungen." (The deeds of human beings live on in their effects.) Nothing could be more truthful, especially in the case of Leibniz. Up to this day the "formerly" royal library in Hannover is keeping a lot of Leibniz' Documents sealed and inaccessible to the public. Insofar, Jason Ross was surely providing a valid picture of what Leibniz means for us today. Yet there are a couple of things he said or expressed, which I tend to firmly disagree with in some way. It is very understandable that in the face of Leibniz' vast work during his life time, only a general overview of the things which he achieved is possible. Now, I think it is exactly this fact which encourages some favored politically motivated cherry-picking, if you will. It is of course absolutely legitimate and necessary to use the essence of Leibniz' principles and mottos in today's political and economic processes in order to emphasize the role of human creativity in society, but I am always amazed by the half-knowledge that is unfortunately applied in many of these well-meant attempts and I was also increasingly having the impression that Leibniz' work is instrumentalized in attracting a certain brand of people to the LaRouche Organization. In that context I have a few things to say, which may not be welcomed on the intented forum. What mostly disturbes me is the ease in which the great moral questions and principles are talked about with utmost emphasis because they seem logical for a moral human being belonging to the LaRouche-Organisation, while when it comes to small details, where exactly these principles found their expression in Leibniz' work, where he expressed this beauty not only in words and great philosophical essays, but in notating physical principles in the language of mathematics as with the calculus, then most speakers, like Jason tend to give up, because they simply don't know, why Leibniz' calculus was superior to Newton's theory of fluxions or why Vis Viva was actually superior to Descartes notion of mechanics. Yet the answer is so simple and every LaRouchePAC member surely could pray it right off their hearts. The difference is that Leibniz stuck to universal physical principles all the way, reducing his applying of a priori assumptions to an absolute and plausible minimum. Yet it is to be noted, that he did by no means entirely remove the use of a priori assumptions. The words "mathematics" and "a priori assumptions" are terms, which Mr. LaRouche, the leading mind of the LaRouche-Organization, continuously condemns in his speeches and public appearances and this, in my view, for the wrong reasons. Leibniz' calculus for instance, the principles of which were clearly documented in his work "On the quadrature of the circle, ellipse and hyperbola" is a testimony of the true principle of human creativity, the principle of the "simultaneity of eternity" and the principle of principle itself. When approaching a study of this work one has to apply a little persistence and patience, because things don't reveal themselves immediately as to why he was doing the proofs of methods and principles in the existing order. The diligent student will surely be rewarded later on especially in Propositions 6 and 7, where it becomes clear that all the previous Propositions were building blocks in order to create a prove for a higher hypothesis and the mystery as to why Leibniz' mathematical notation, what is known as the calculus today, actually works becomes entirely eliminated. In essence, all what the calculus is about is the fact that there is no nothing and that the principles of proportion (in this particular case in triangles and rectangles) maintain their validity also in the infinitely small. In order to demonstrate the validity of his developed hypothesis, he made use of the same a priori assumptions as those people, who discovered universal principles before him and he put them to further use for the development of a higher purpose. He went on to engage discoveries by people like Gregoire de Saint Vincent, Michelangelo Ricci, Evangelista Toricelli, John Wallace and even Rene Descartes. Yes, even he contributed to Leibniz's concept, because although Leibniz did not grow tired of pointing out the danger of reducing the concept of the Universe to point, length, area, volume and time by means of what everyone today knows as a cartesian coordinate system, he still was able to extract some usefullness of this concept by putting his very own spin on it. This means the LaRouche people's strong and persistent bashing of Rene Descartes is alright only as long as you point out that Descartes came to the right results for the completely wrong reasons. This is surely most cendemnable and of course bears the strong suspicion of plagiarism, but it still can't be denied that some of the stuff Descartes produced, whatever way it may have been achieved, even though with the wrong reasoning, was useful. And Leibniz as an absolutely superior scientific character put his spin on it in order to turn Descartes' quasi discoveries into something good. Looking at this, one can draw a clear analogy to the "Delian Problem" or better known as the Doubling of the Cube. The people of the greek island Delos consulted the Oracle of Delphi in order to get advice on a prolonged plague crisis. The priests of Delphi, today known to have been a fraudulent bunch of oligarchical tools, gave them the order to double the Altar of Apollo, which was a Cube, in volume in order to manipulate political conflicts to their favor and maybe to willfully induce some population reduction. The Delians being completely confused by this strange order, consulted Plato, who cleverly re-interpreted this task as a request to engage people's minds more in geometry and mathematics to calm the situation and to teach them creativity. By doing this he actually managed to turn something evil into something good. The same thing can be said about Leibniz' dealings with Descartes. Mr. Larouche certainly acted also to redirect the solution of a "delian problem" of another type and the SDI is exemplary for that, but unfortunately, today I do not see much anymore of this type of legacy in action. So Leibniz through his "communication" with scientific figures of the past, who at their times had no idea about how their discoveries would be used in a later time, but yet may have been aware of THAT they will be used in the future, is the best example of the principle of the Simultaneity of Eternity, which says that the communication of human ideas does not only go back into the past, but also into the future, depending on the standpoint of which participant one is taking, because these ideas actually change the future. As it also could be seen in the Q&A session in the LPAC video as per Rachel Brinkley's request, the interest, also among the LaRouche-people themselves, to get to the core as to why Leibniz's calculus was superior to Newton's, is very present. I just hope that this is not just another manipulative trick attempting to activate a certain group of people in order to put them into vibration again. In order to understand the difference between both calculi and in order to understand the principles at work there, one has to go through the effort of actually reading and studying them and paying attention to the details. There used to be people in the Larouche-Organization, who did exactly that and who got exempted from it, because they were confronted with the allegation that they would lose sight of their political goals. I am strongly opposing this view, because if you neglect the details, which actually led to the discoveries and which are necessary to describe the ideas and the processes, which a creative mind goes through in order to be able to actually articulate the discovery, then you are not eligible to speak with authority and credibility on the great philosophical and moral questions, because the one doing so is lacking the rigor, to really understand creative processes instead of only talking sweet words about them. On the part of Leibniz, in terms of the calculus, his reasoning is very clear and rigorously articulated in the aforementioned treatise of "On the quadrature of the circle, ellipse and hyperbola", while Newton's articulation in his "The Method of the Fluxions" is very clouded and nebulous, constantly giving the impression that he is hiding something. People who are serious about getting to the core of the calculus will have little difficulty in understanding, how Leibniz came to his calculus, but they will have great difficulties understanding, how Newton achieved his conclusions. Every pupil who is going through this type of excercise will not only be witness to the acting principle of creativity, but will as well learn a political and philosophical lesson, because this comparison is a perfect example between the acting Promethian and the acting Zeussian principle. I don't really see any reason, as to why Mr. Larouche could have possibly rejected this type of work so strongly, other than organisational and structural machinations unseen by me that may appeal to very low of instincts inside human beings. The permanent Larouchian condemnation of mathematics as a science is a very stupid thing to do, especially, when looked at from the standpoint of political processes. Of course, Mathematics is not a physical science. No one having thought about that deep enough will be able to deny this. But rather than suggesting that mathematics should be squashed all along, as Mr. Larouche continously does from time to time in order to make his crowd focus on political goals, it should be pointed out that Mathematics is to be viewed as a language. The language of "DESCRIBING" (and not creating) the ideas on physical processes that have been discovered by creative minds. I think it is widely understood that Language is not the primary source of a creative idea, but certainly is a most necessary utility to enhance creative processes, to which language itself adapts. No more no less. Languages and their development most certainly do deserve to be looked at from a scientific standpoint. And without a language there can't be any creative human process, as Mr. Larouche himself also pointed out repeatedly. Leibniz himself was endorsing mathematics exactly as that in many letters and communications with contemporaries. So Mr. Larouche actually is being very contradictive, when condemning Mathematics as a science on one side and endorsing Leibniz on the other. Leibniz certainly would not have approved of Mr. Larouches definition of that and this is a documented fact. It is human nonetheless, but certainly not in favor of a speakers credibility if he elaborates in the highest tunes about the essence of Leibniz' major philosophical and economic works but then failing to be adept in these small but necessary details. This problem is actually indicative of the failure of the Larouche Organization to gain a necessary broader audience and support. Their problem is that they are trying to address the 'uninformed' people from the highest moral standpoints, but lacking the ability of rigor in explaining the very principles and their constitutions in rigorous scientific work which supports morality in conclusion and finally ending up in evasive answers. That is the very difference between Mr. Lyndon H. Larouche and Gottfried Wilhelm Leibniz. Leibniz was most rigorous in all his approaches when he was attacked by opponents, whether they were scientific or political. He had the ability to prove his opponents wrong in a most rigorous and socratic way, while Mr. Larouche oftentimes appears very dictatorial and a lot less rigorous about his ideas and therefore not leaving his own and other people a lot of room for a healthy dispute and discussion about scientific and political matters alike. And that, unfortunately, hasn't changed for a very long time. Mr. Larouche is in my view lacking the understanding that the existence of a scientifically opposed view, which always will or will not be more or less scientifically valid than another view, be it your own, is an essential necessity for progress, as it forces a dispute that may end up being productive if done right. Above all it is the essence of a dispute between contradicting views, to represent the catalyst of taking different angles and of forcing the undertanding by need for rigorous explanations. And this, in my view, was actually exactly the reason why Leibniz' calculus became so widely popular, because the dispute between him and Newton actually made it widely available and accessible, because it forced Leibniz repeatedly to explain it step by step in a degree of rigour that was unachieved by Newton. It was admittedly very bad for Leibniz immediate legacy and it is also clear that a clean scientific dispute was not the primary of Newton's intentions, but what is clear today is that this dispute more or less forced out the truth more intensively. maybe with the exception of Kesha Rogers, who always has a very special clever stillness about her in most of those staged discussions. So, in my view, Mr. Ross' analogy between Gottfried Wilhelm Leibniz and Mr. Lyndon H. Larouche is not correct for the aforementioned reasons and I wish that the attitude of many of the productions and shows would change more from a scripted play to the format of real honest, inviting and transparent socratic discussion, which is not ruled by an unspoken code of conduct not to challenge Mr. Larouche by any means, just because he is the head of the organization. Therefore, I most welcome the idea to generate a dialogue between the so-called 'uninformed' and what is left of the basement people if it takes the form of a truly socratic dialog rather than a unilateral lecturing. This would make the whole organization more credible and give more people the room to come forward to engage in a real socratic way of being educated rather than being lectured about morality by people, who know how to sing along but are laymen to the principles themselves, because they did not endulge in paying attention to details. I hope that my criticism at this point derives some productive and constructive thought process in some of the people addressed.